Attorney Abigail Miranda, recently named to the board of the Women’s Center of Greater Danbury, organized Cramer & Anderson’s participation in the 9th Annual “Hearts of Hope” Breakfast on Feb. 8 at the Fox Hill Inn in Brookfield. The annual event was sold-out and “raised over $30,000 and counting” for the nonprofit organization founded in 1975 that creates a safe haven as the sole provider of services to victims of domestic and sexual violence in the Northern Fairfield and Southern Litchfield counties. Attorney Abigail Miranda, center, with her husband, Joe, right, and Attorney Barry Moller. Key areas of focus include emergency shelter and support services, counseling and advocacy, crisis intervention, and community education, primary prevention and training. In all that it does, the Women’s Center pursues a vision of ending violence against women, men and children and fostering equality and empowerment for all. In mobilizing the firm’s support of the Women’s Center, Attorney Miranda was joined at the breakfast by Attorneys Barry Moller, John Tower, Ted Backer and Jennifer Collins, along with two of the firm’s paralegals, Kelly Simpson and Nancy Quatraro. Attorney Miranda’s husband, Joe, also attended, as well as her mother, Marge Tymula, who manages the local student transportation company for Danbury Public Schools and has worked with the Women’s Center in the past coordinating transportation for students from confidential safe houses. 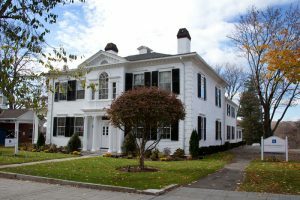 “The firm recognizes that The Women’s Center of Greater Danbury is 100 percent self-funded and its fundraising events are extremely important for the maintenance of the free educational and supportive programing the Women’s Center provides to families and women across 13 towns and cities in the Greater Danbury Area,” said Attorney Collins. Former Board of Directors members Barbara Cottingham and Lynne Phillips were honored at the breakfast with the Women’s Center’s 3rd annual Service Above Self award. The breakfast included a demonstration of the Women’s Center’s educational programing, as well as informative speeches from a local middle school administrator, the center’s Director of Education, Ann Rodwell-Lawton, and an adult educator/advocate. , Divorce & Family Law, Municipal Law, and Personal Injury Law. She may be reached at (860) 355-2631 and by email at amiranda@crameranderson.com. The firm also has offices in Litchfield, Kent and Washington Depot. For more information, see the website at crameranderson.com or call the New Milford office at (860) 355-2631.